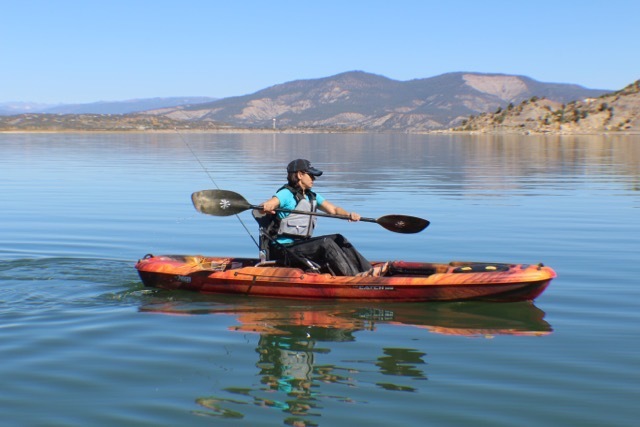 I’ve been thoroughly enjoying the experience of test-driving, or rather test-paddling, a soon- to-be-released kayak from Pelican International. Mia and the Little Gal is sponsored by Girls with Guns Clothing, and we know they love stand-up paddle boarding, too! Pelican delivered the Catch 120, prototype kayak, after a local show. They did so in trade for me sharing a review about it with you all. The unfortunate part is after I’m done I have to give it up. I say, “unfortunate” because I love it, but it will be gifted to a local non-profit organization. Stay tuned. I’ll be sharing pictures of the presentation of the kayak. The Catch 120 is a fishing kayak. I’ve used it for fly-fishing and bow-fishing, as well as general pleasure paddling. It has an adjustable/removable seat and foot pegs, which are fabulous for shorties like me. It has multiple rod and paddle holders. The dry-storage area sports a sealed lid. It’s perfect to stow your drybag. It also comes with a recessed gear-stow area, which one of my 4-legged friends thought was quite comfortable. The Catch 120 is very stable on the water. 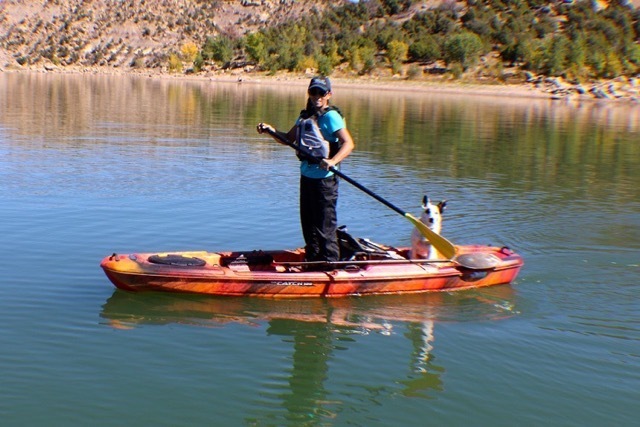 I was able to paddle seated or standing, with a pooch on board, in calm or rough waters. The flat deck made for easy balance while standing or seated. It’s a breeze to maneuver, even up small creek channels and other inlets. I’ve also found it comfortable to manage even when large fish are at the end of the line. The downside of this “lightweight” fishing kayak is that it’s 12-feet long and 34-inches wide. It was difficult for me to solo-carry. I contacted Pelican to probe for additional information regarding carts, accessories other items they may offer. You may be pleased to learn Pelican International’s Vice President of Sales is a woman. 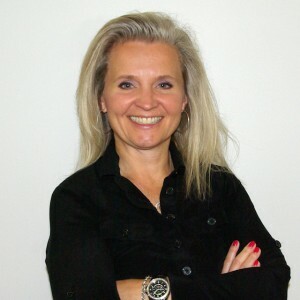 Margaret Kordas, grew up near the water and in an area surrounded by parks and fields. She says this allowed her to connect with nature at a very early age and she is passing the bond on to her children. I asked her a few more questions, since it is not every day I get to interview a woman who is influential in the kayaking world. Mia: What Pelican product do you think our WONderful readers would love to see? Margaret: I think the Catch 120 is appealing for outdoorsy families because of its price tag, which is significantly lower than what most of our competitors are offering. But the great thing about Pelican is we have a product and price range for most families. Our tandem kayaks such as the Unison are popular with couples and parent-child teams who want to explore together. We also have starter products for young kids like the Solo, a six-foot sit on top kayak for small children, and the Vibe 80X, which is the next size up. But our water product versatility is demonstrated when families can also consider a traditional Pelican canoe or even an enjoyable pedal boat. Mia: Does Pelican offer other items that would come in handy while I use the Catch 120? Margaret: We have a variety of accessories that can make the kayak fishing experience more enjoyable. From a kayak/SUP/canoe cart for better transporting to additional flush mount and swivel rod holders, it all depends on how much of an interest you have in your watersport of choice. Mia: Where do you see Pelican heading, in regard to the women’s market? Margaret: We are seeing a growing interest from women in not only kayak fishing, but also in areas like stand up paddling. Women are purchasing our SUP boards to both challenge themselves on the water and to go zen and enjoy yoga in the middle of nature. Our social media followers are nearly a 50/50 split in terms of men and women – and that is a great long-term sign that female outdoor enthusiasts believe in the Pelican brand. With a new second factory on the way and a perennial eye on the trends, Pelican is well positioned to continue to be a leader for the needs of women (and men) water adventure seekers. Mia: As a female in the industry, do you feel there are particular items Pelican has designed specifically with women in mind? Margaret: Our products are a great fit for women. For example, our RAM-X™ polyethylene material that is used in our products is light to carry and impact resistant in the water. I would also say that our catalog features some of the most trendy and eye-catching color schemes ever seen on a kayak. Finally, without giving anything away, we’re working on a couple of other appealing items for women as well. The Pelican Catch 120 will be available in Spring of 2016 in Lava and Olive Camo color options.